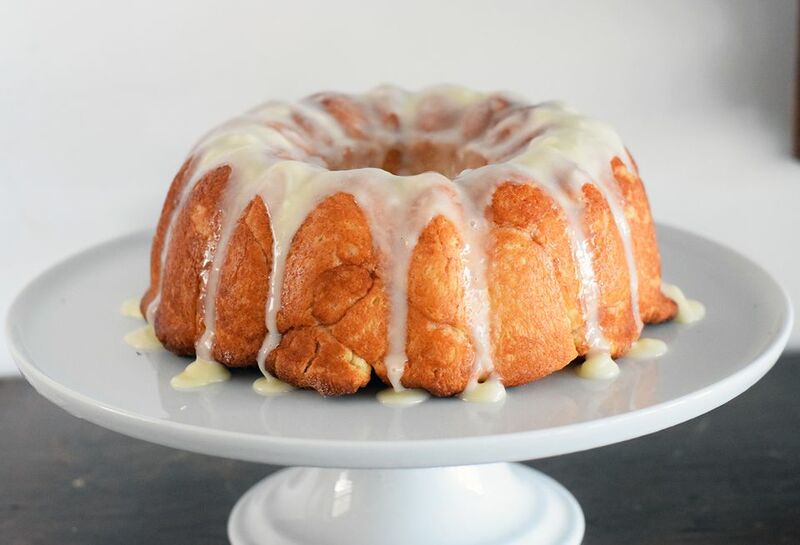 Monkey bread is a great coffee cake or party dessert, as it's easy to grab individual pieces off of the bread without touching the entire loaf. It's known by many names: puzzle bread, pinch-me cake, Hungarian coffee cake, and pluck-it cake. But no matter what you call it, it's wonderfully delicious and addictive. We've included a homemade sweet bread dough recipe that is absolutely divine -- especially for cinnamon rolls-- however, if you are running short on time you can always use pre-made biscuit dough or dinner roll dough. Just follow all of the remaining instructions after the dough instructions. If you'd like to, feel free to make the bread dough ahead of time and place it in the refrigerator until you are ready to use it. Always a great aspect of a recipe, especially if you have a busy schedule, or are planning on making multiple dishes for your meal. In a medium-sized saucepan heat the milk, butter, and sugar until the milk is hot, but not boiling, and the sugar has dissolved and the butter has melted. Take it off of the heat and allow to cool to lukewarm. Transfer the milk mixture to the bowl of a stand mixer. Add the yeast on top and allow it to soften in the milk. Slowly add the flour and salt until it is totally incorporated. Cover your bowl with a towel and allow to rise in a warm place for about one hour. Punch down the dough and add more flour if it is too sticky. Grease a tube or bundt pan with non-stick cooking spray. Stir together the cinnamon and sugar in a bowl. Break off golf ball-sized pieces of dough. Roll them slightly into balls and then roll them in the cinnamon and sugar mixture. Arrange the dough balls in the bundt pan until it is full, but not overflowing. Pour the melted butter over the top and along the sides of the pan. Bake the bread on a center rack for about 25 minutes, or until the top is golden brown. Allow the bread to cool slightly and then flip it onto a serving plate. Allow it to cool completely before adding the icing. For the icing: whisk together the icing ingredients in a bowl until completely combined. Once the monkey bread has mostly cooled, pour the icing over the top and start digging in!